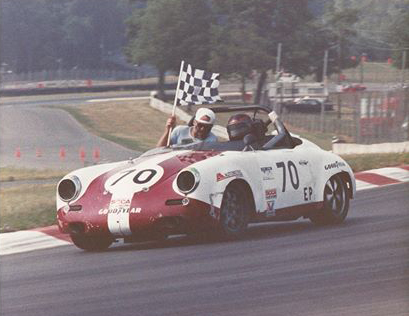 Yes, that’s Barbara driving on a victory lap at Mid-Ohio. I’m holding her checkered flag. I think I’m telling her to slow down; she was scaring me. We met very briefly last summer at Road America, my name is Jimmy Pelizzari and I am Patty (356B mouse) Pelizzari’s son. I thought I would get in touch with you about a hillclimb I am helping to promote up here in Leelanau. The Empire Hillclimb Revival will be Saturday Sept 20th and not only did I think you would possible like to run but am wondering if you would help get the word out to the vintage racers? All it would require is a $50 NASA membership and $175 entry fee. Let me know if you have any questions. Thank you so much and happy racing! 2014 marks the revival of a Northwest Michigan classic, The Empire Hill Climb. The race was run from 1964 to 1980 and at long last it is back! The course will be a short but challenging .5 miles and 8 turns, just a short walk from the shores of Lake Michigan. Parc Expose will be in downtown Empire letting spectators get up close and personal with the race cars before they make their way up the hill. During its original running some of the best cars of their time made their way up the hill such as Austin Healey’s, Jaguar E-Type’s, AMC Javelin and Gremlin’s, Formula Ford and V’s, Triumph’s, Corvette’s, Porsche’s and even a Ferrari or two. The scenic hillside offers fantastic spectating as the cars wind their way up the hill spectators can sit nearly above the racecars – close, but safe from the action. Cars from all genres of racing will be present so come camp out in the woods and watch as the Empire Hill Climb Revival gets underway! I received this story and pictures from Phil Planck regarding the Harbor Springs Car Festival. 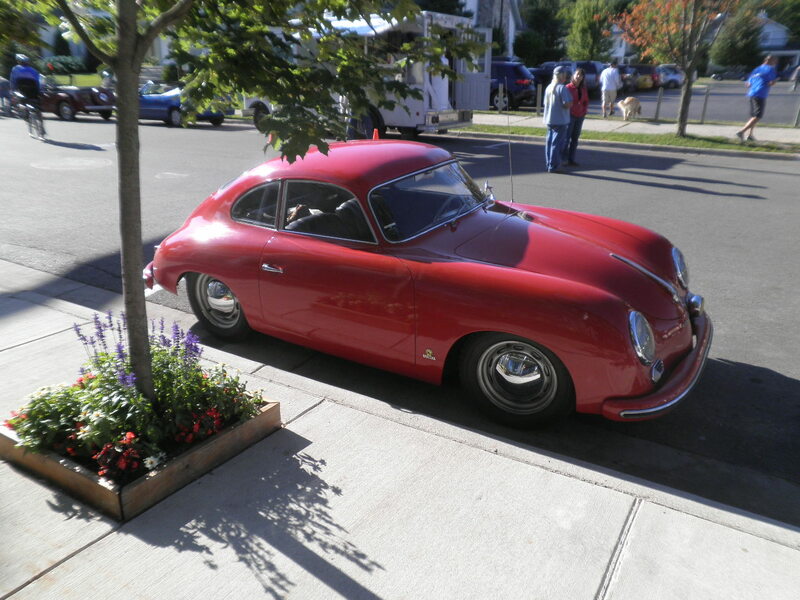 “Nancy and I drove over to Harbor Springs today hoping to see some 356s. It was not to be as we were the only one there. We saw three MGA’s, Two Healey’s, one TR3 and one Barndoor VW bus. The featured cars were rat rods, so we took lots of pictures of those. I enjoyed seeing the 55 100-4M Healey as I had a 55 100-4 years ago. There was a nice assortment of old cars and it was refreshing for the lack of muscle cars. We got there at 5:35 and the park was already full, so we had to park about a block away on a street that was blocked off to traffic. It worked out well as the cars were crammed in like sardines and it would have been hard to leave early as there was quite a crowd to negotiate around. We left about 6:30 and made it home at 9:30. I got to try out my new, improved headlights as I just installed a relay down by the dimmer switch which took the load off of the headlight switch. The method with only one relay works on Pre-A’s, but not later models. I have reconditioned the headlight switch once and that lasted about 10 years, but noticed it was really getting hot again on the way back from Santa Fe last fall and the lights were getting dim. While preparing the Pre-A for the trip to Harbor Springs I think I mentioned that I put a headlight relay in down by the dimmer switch. In order to do this I had to remove the floor boards. While down under there, I found what I thought was a penny. Found it on the work bench today and cleaned the crud off and it is a 1949 German coin. Pre-A was a European version, not Continental, and C of A said for delivery: “Porsche factory car”.